B0172. ALBERT SPALDING. 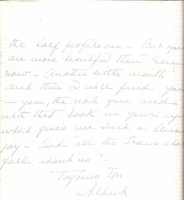 Ton Albert qui t'adore - The courtship letters of Albert Spalding to Mary V. Pyle , (Edited by Suzanne Spalding Winston). Privately printed (Edition of 1000 copies) at Canaan, NH, Phoenix Publishing, 1988. 109pp. Photos; DJ. "To read these letters is to meet, become acquainted with, and to admire Albert Spalding. Few musicians have shared their dreams, doubts, and innermost thoughts as completely or in such a polished manner as did Spalding....a self-portrait of a world-renowned instrumentalist who comes alive through his letters....Suzanne Spalding Winston worked with her uncle on his memoirs RISE TO FOLLOW ....[she] has transcribed the Spaldings' letters of a lifetime to make them accessible to music historians."